Having a truck gives you a ton of potential for undertaking outdoor adventures. To help you find the best shelter for overnight stays in the wild we’ve hunted down great truck camping tents to share. Lets start with an introduction of the basic options. The Napier Sportz Truck Tent is packed with convenient camping features. If you’re camping solo or with one other person, a truck bed tent might be the best fit. The main advantage of truck bed tents is that they keep you comfortably off of the ground. They typically are easy to set up with fiberglass pole systems and securely attach to trucks via included straps. The Napier brand in particular makes convenient truck bed tents that have durable sewn-in bottoms. 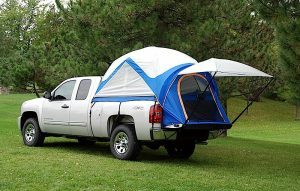 The disadvantage of truck bed tents is they tend to have a maximum capacity of two adults. If you’re camping with a larger group or family you’ll probably want to consider a traditional car camping tent. These tents can accommodate several adults and have taller ceiling heights compared to truck bed tents. Fortunately there are many dependable truck camping tents for either of these situations. 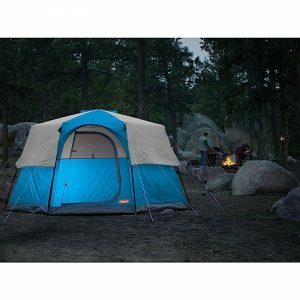 Browse the table below to compare the best tents we found by capacity, height, price, and average rating to see which may work for you. 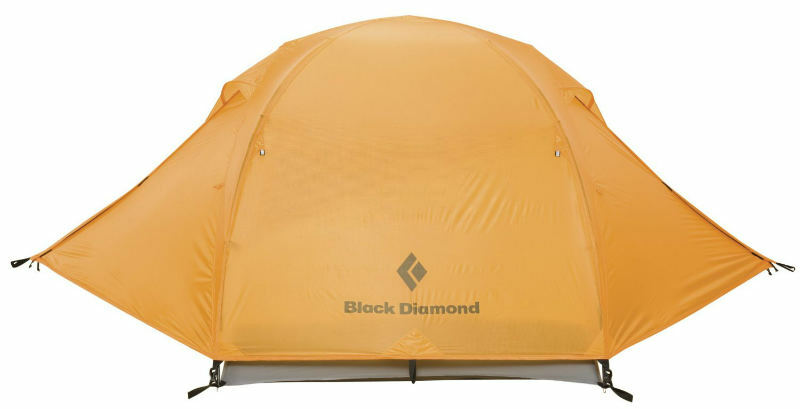 Continue reading below the table for more details on a few of our favorite tents. Hopefully the comparison chart proved useful in getting a sense of the types of truck camping tents and you now have a better idea of which may work best for you. Now we’ll go into more detail on a few of our favorite tents. The Napier Backroadz Truck Tent is a great option for truck bed camping. 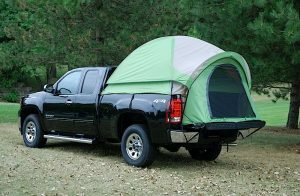 One of the coolest things about this tent compared to other models is that it is available in five different sizes to suit just about any truck bed. Sizes include 5 foot 5 inch, six foot, six foot six inch, 8 foot, and 9 foot options. Tents of all sizes have a center height of 5 feet 5 inches. 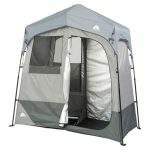 A durable polyester fabric canopy makes the tent fairly weatherproof, while a mesh door and four large windows provide good ventilation. Unlike some other truck bed tents, this model has a sewn-in polyethylene floor as well. 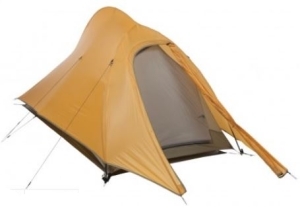 Shock-corded fiberglass poles are used as the tent’s frame. The tent is designed to be set up inside truck beds and attach to the truck with included tent straps. 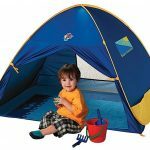 Campers report that the tent stays put once set up and holds up well to a variety of weather conditions. They also like that a carrying case is included for convenient storage and transport. 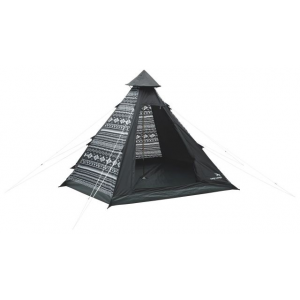 While feedback for this tent is overwhelmingly positive, there are a couple of common cons mentioned by reviewers. Firstly, there is a bit of a learning curve for getting the tent set up. However, most say that after getting used to set up and take down the tent is rather easy to manage. The more problematic issue mentioned is that the tent straps scuffed paint on some reviewers’ trucks. The Napier Sportz Truck Tent is another standout truck camping tent, and it is available in 7 different sizes to work for full, mid-sized, compact, and quad truck beds. All sizes have a center height of just over 5 feet and 6 inches. 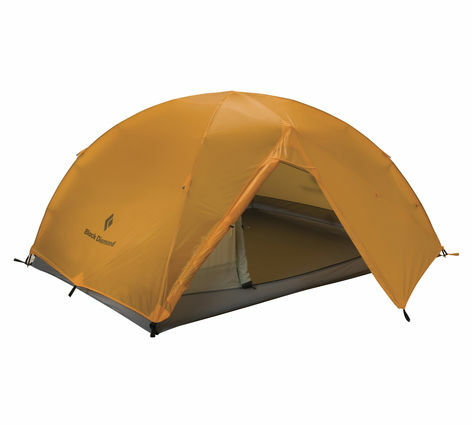 The tent has a polyester canopy and a sewn-in polyester oxford floor tarp. An entrance door and 2 mesh windows function to provide ventilation inside the tent. There are two neat features that separate this option from the pack. 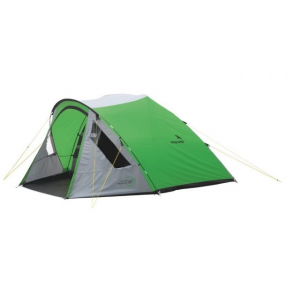 Firstly, this tent has a 4 by 4 foot awning to provide extra shade right outside the tent door. Second, this tent has a rear panel that allows for access to a truck’s cab through the back window so if you need to grab something inside of the truck you don’t have to leave the tent! Other noteworthy features include a gear loft, a gear pocket, a lantern holder, and a carrying case. Further, this tent includes a set of strap protectors to protect truck paint from damage. Now that we’ve covered the main features and highlights, lets go into a few of the downsides mentioned by reviewers. One design issue is that the front door of the tent does not unzip on the bottom so it gets in the way when getting in and out of the tent. The setup directions are also difficult for most people to follow. Overall campers report that the tent holds up well to the elements, but some campers experienced problems with the tent seams during rain. 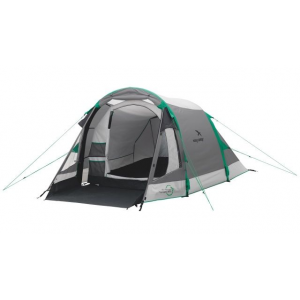 If you’re truck camping with a family or large group, the Coleman Octagon 98 Tent is an option to consider. Truck bed tents typically only have a two-person capacity, so for larger groups it’s necessary to pack a traditional camping tent for shelter. 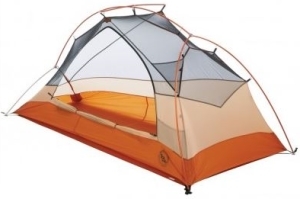 This tent can accommodate up to 8 adults to serve that purpose, and it has a center height of 6 feet and 10 inches. 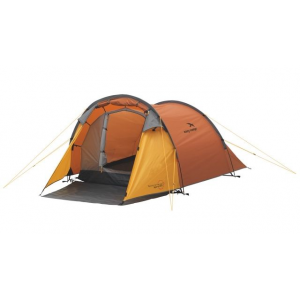 While it provides quite a bit of interior roominess, this tent is not too difficult to transport or set up. 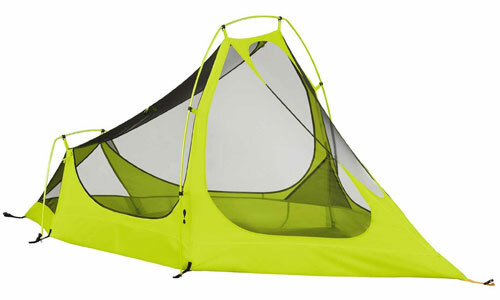 The tent packs down to a manageable 11.75 inches by 13.5 inches by 34 inches and weighs 40 pounds. It’s a decent size for packing into the truck. A polyester taffeta canopy and a floor with welded seams combine to form a dependable camping shelter. 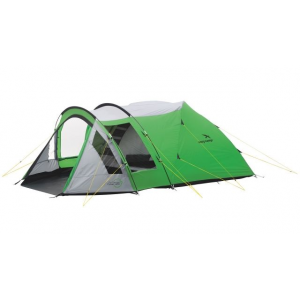 The tent also has two doors and several mesh windows, providing easy access and good ventilation respectively. 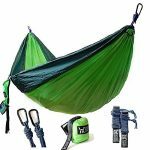 Other notable features include a color-coded pole system to aid with set up, two inner storage pockets, and a carrying case.